I sure do love a lazy, slow-cooking Sunday. Some people would say, that’s just tweaked. Given a perfectly good free day, what thinking person would choose to spend it in the kitchen..cooking..?! But to me, a cold, snowy Sunday with all burners lit is a good Sunday. I’ll save the skiing for the next sunny day that reaches 30 degrees…wimp that I am. 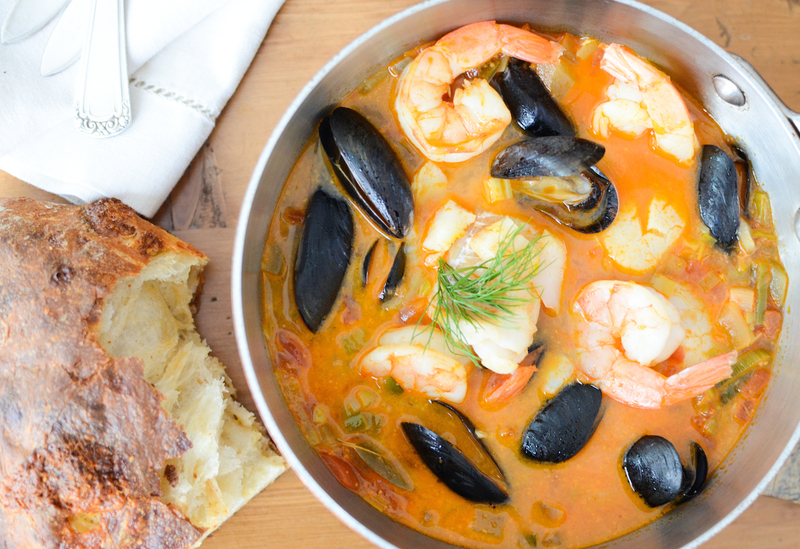 This Bouillabaisse was a good Sunday project. 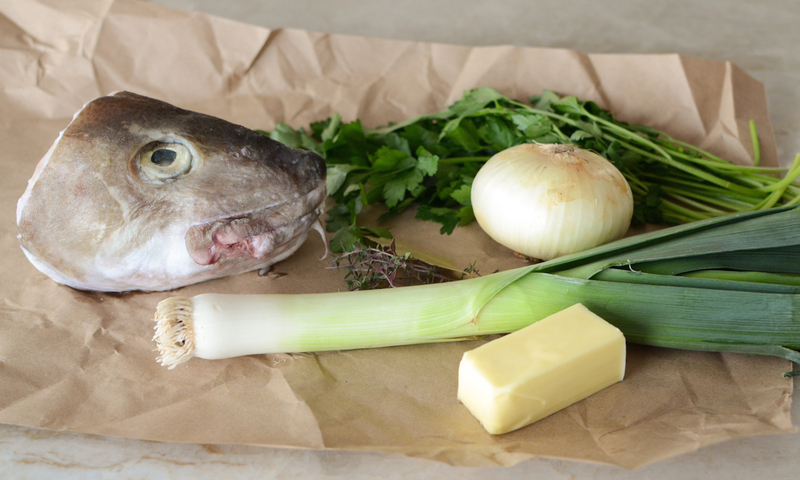 I procured a big old (not actually old) Cod head to make fish stock, but that’s just my idea of fun. 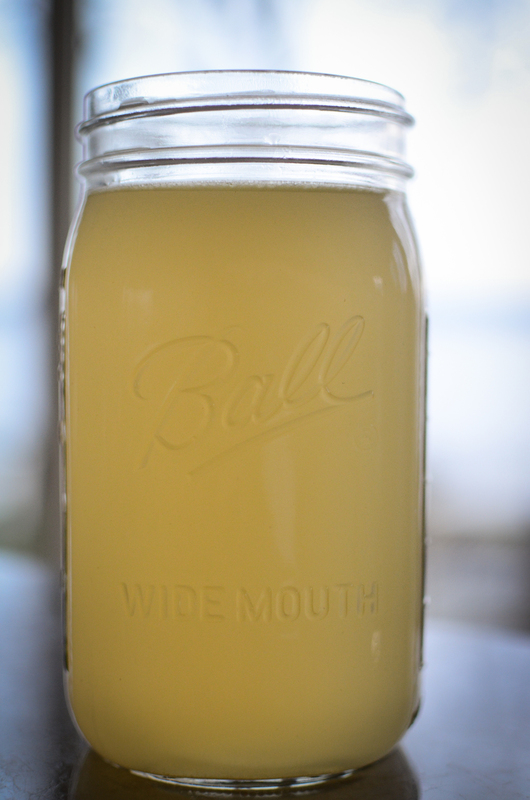 You can use store bought fish stock, vegetable stock or even just water and wine for your broth. This version is assertive and spicy and will give you lots of broth for sopping up with a big hunk of french bread. 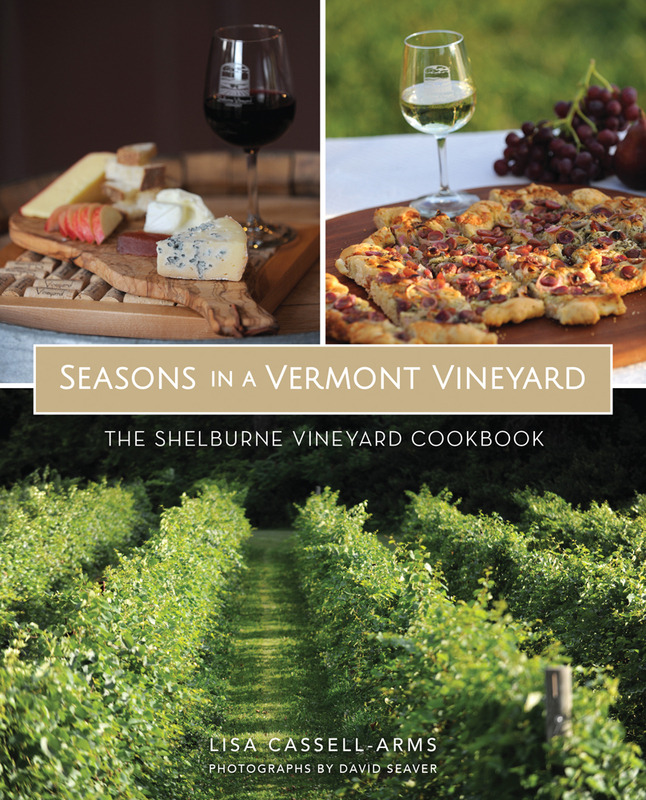 Serve it with a garlicky, red pepper rouille (recipe included), a hunk of crusty bread, and a cold, minerally white wine like a Muscadet or dry Riesling. Julia Child, always the voice of reason, has this advice for us ordinary people! Make the Rouille, see recipe below. In the bowl of a food processor, combine the roasted red pepper, soaked bread, red pepper flakes, garlic, and egg yolk. With the processor running, add the olive oil in a thin stream until emulsified. Season with salt and pepper to taste. In a large soup pot over medium high, heat the olive oil and butter. Add the leeks, fennel, onion and jalapeño, and sauté until translucent and soft. Add the garlic and tomato paste and cook until garlic is just soft, about a minute. Add the tomatoes, saffron, orange zest, fennel seeds, bay leaf and thyme. Stir and cook over medium for about 5 minutes. Add the white wine, Pernod and the stock. Increase heat to high and bring to a boil. Reduce heat to medium low and simmer for about 10-15 minutes, until slightly reduced. Whisk in 2 tablespoons of the rouille. Season to taste with salt and pepper. Add the Cod, shrimp, scallops and mussels, gently nestling them into the broth, and cook at a low simmer for about 5-7 minutes, until the fish is tender and just cooked through and mussels open up. Discard any unopened mussels. 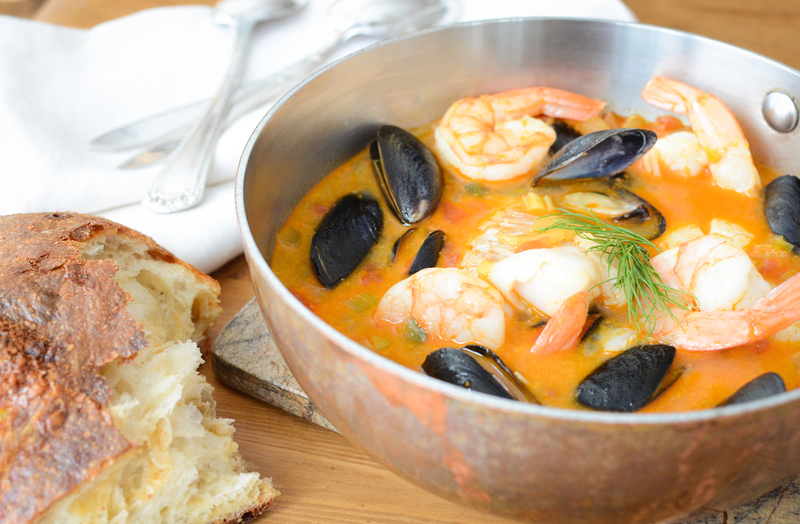 Serve in big bowls with crusty french bread and rouille on the side for mixing in. 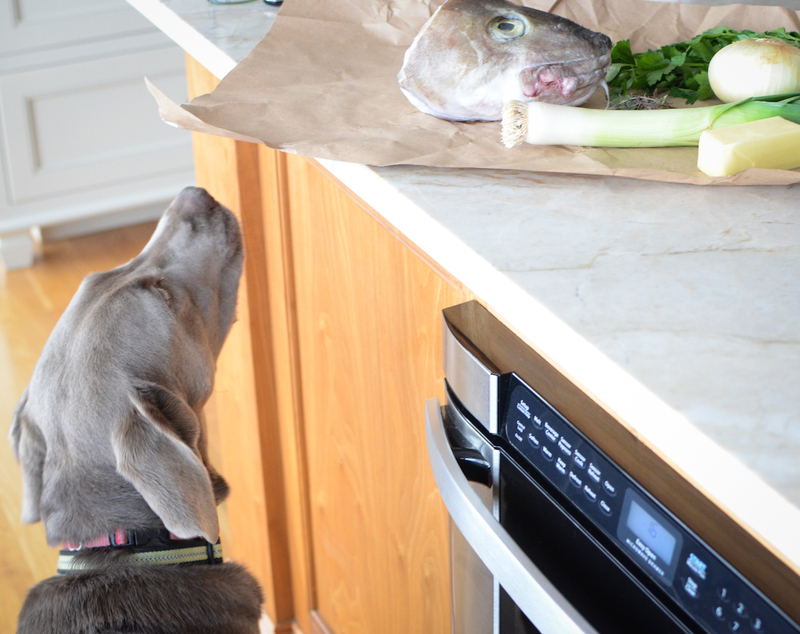 Zoe is very interested in the ingredients for my fish stock.